Who remembers the 1969 Alka Seltzer commercial? On Saturday, the plan was to remake the spicy calamari salad, I’d made the previous Sunday because the original would not have given the guy in the heartburn. It lacked kick. I’d also served it cold the first time. I decided it would be better warmer on the temperature side and the Scoville scale side. Call me crazy, but when the fish market sign says their hours are Friday 7:00-7:30, I expect them to be open at 7:15. It’s particularly annoying when I made the point of going to the fish market while power walking, to check their hours. I was lulled into a false sense of security by their sign only to have the place shuttered at 7:15. Was it a big deal? [Cue the sound of the privileged people whining] Absolutely not, in a world where much more horrible things happen to much nicer people every second of every day. This definitely gets filed under the First World Problems: Uppity Brooklyn Neighborhood edition. Luckily, uppity Brooklyn neighborhood dwellers are well catered to and the Union Market is opened until 10pm and had calamari. They also beautifully cleaned skate wing which I also bought and cooked for the first. Man, that was delicious! I have to make it a few more times before I write a recipe. Stay tuned. When I originally devised this salad, I was trying to riff off the Calabrian tuna tartare dish I had at the restaurant Santina. It was wonderfully spicy and served with a chickpea crepe called ceci on their menu. I was fascinated by the ceci because it was delicious and gluten free. I was definitely making the ceci, but what to put on it? There was no sushi grade tuna at Whole Foods the day I decided to make ceci, so I decided to make a calamari ceviche to go with the crêpe. The first version was nice, but it lacked heat so I threw in some Italian long hot peppers the second time. Calamari is like an empty canvas since it’s not very flavorful. The chilies along with the anchovies, garlic and fried capers really give this salad punch. I also made a mushroom, zucchini and fennel topping for the ceci as well. The mushroom dish worked great with the chickpea crêpe because it’s like a cooked chunky salsa. I like this calamari dish better as a salad. Crusty bread works better as an accompaniment than the ceci did. 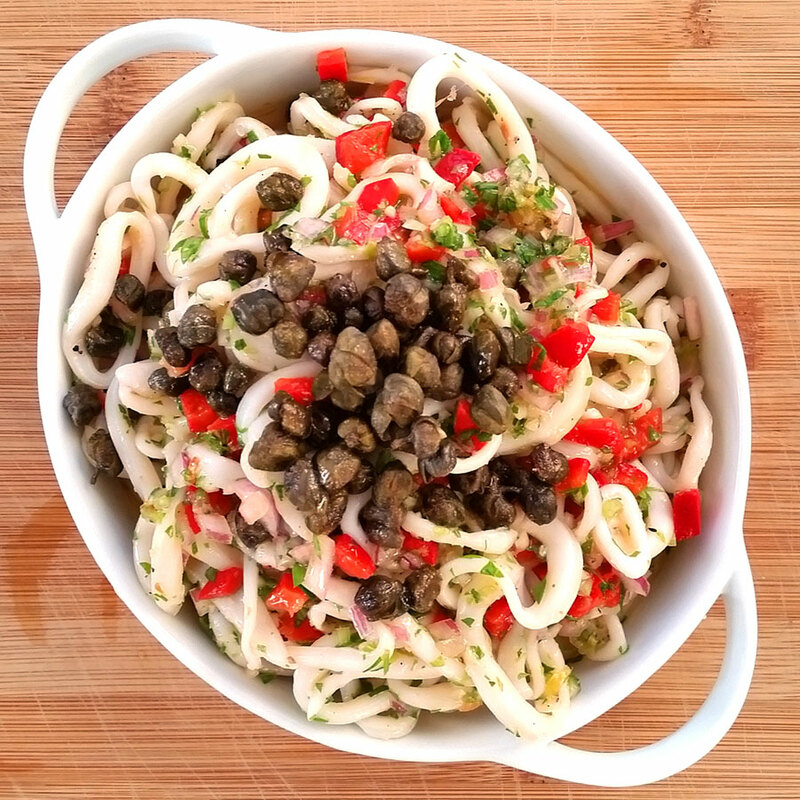 Sautéed hot and roasted peppers add zing to this warm calamari salad topped with fried capers. In a medium saucepan, bring 1 quart of water and 1 tablespoon of kosher salt to a boil. Have ready a quart sized bowl of cold water with ice cubes floating in it. Boil squid for 30-45 seconds until it just turns solid white, strain in a colander and immediately plunge the squid into ice water to stop it cooking. Once it’s cool, strain it well and set it aside in a medium bowl. Peel and slice the garlic and set on a piece of paper towel for 10 minutes to drain. Heat 2 tablespoons of olive oil in a small skillet over medium heat. Fry garlic until golden, about 1-2 minutes and remove from the pan and drain on paper towel. Add the capers and another tablespoon of oil to the pan and fry them until they are crisp about 2-3 minutes. Remove them from the oil and drain them on paper towel. Set aside. Add 1 tablespoon of oil and sauté the anchovies, celery (stalks and leaves), red onion and long peppers seasoned with salt and pepper until they are wilted, about 5 minutes. Mix squid, roasted peppers, sautéed vegetables, garlic, lemon juice, lemon zest and parsley. Season with salt and freshly ground black pepper to taste. Add more olive oil if necessary. Add some crushed red pepper flakes if you like it spicier. Arrange lettuce leaves on a plate, place squid salad on top and sprinkle with the fried capers. Serve this salad with crusty bread to sop up the dressing.